And so Downwind Month continues. At the same time Connor Baxter was winning his sixth straight Maui 2 Molokai race on Saturday, one of his key rivals in ocean racing, Travis Grant, was dominating the Cline Mann Memorial Paddleboard Race over on Oahu. Perhaps it was symbolic that Connor crossed the line first on Molokai while Travis won on Oahu, as these guys are the two favourites for next weekend’s Molokai 2 Oahu showdown. Connor has won three of the past four M2O showdowns, while Travis is the 2013 champion and went very close to beating Connor twelve months ago. If I was a betting man, I’d expect the odds to be heavily stacked in favour of Connor and Trav. And that says a lot, because they’ll be up against guys like Danny Ching and Kai Lenny. However given past Molokai form and the results so far this year, I think Connor and Trav have the edge on their rivals. I’m not sure which of the two will win – it’s too close to call right now – but I’d be surprised if they didn’t finish one-two. Travis has shown world-beating form the past few months, however Connor is Connor. There’s a reason he’s currenly ranked #1 in the world. It’s almost impossible to bet against him. Should be a cracking contest. But back to Oahu: The nine-mile Cline Mann race course follows the famous Hawaii Kai downwind run, which starts in the town of Hawaii Kai (the finish line for Molokai 2 Oahu) and ends in Kaimana (right next to Waikiki) in front of the iconic Outrigger Canoe Club. Apart from the continued stellar form of Travis Grant, this year’s Cline Mann race threw up a few other interesting highlights. Annabel Anderson was out there on the weekend, giving her 14 footer a tune-up before the big one next weekend. Annabel was a late inclusion into this year’s Molokai field and could be an outside contender for the crown, despite the fact she’ll be conceding a few foot of foam to her rivals. The Lahui Kai team rider will be racing a stock board again next weekend, meaning she’ll be on 14 footer vs the unlimited boards (around 17′) of most competitors. If conditions across the Ka’iwi Channel from Molokai to Oahu are good, it’d take a mighty effort to keep pace with the unlimited weapons that Terrene Black, Sonni Honscheid, Andrea Moller and Jenny Kalmbach will be riding (plus all four of those ladies are former Molokai champions). However if the conditions go sour – i.e. if it’s not a good downwinder – the advantage of the unlimiteds is largely neutralised, which would suddenly make Annabel one of the contenders. Though even with good conditions for the unlimiteds, you’d still think Annabel has a slight chance on her stock board, such is her freakishly strong abilities on a race board. Either way, the Kiwi has nothing to lose: If she wins on stock it’ll be an absolutely extraordinary story. It’s never been done before. If she doesn’t win, nobody will be surprised because her board is 20% shorter than those of her fellow female contenders. One of the strong favourites for Molokai, Terrene Black, took out the race on Saturday, finishing first on her unlimited in a time of 1:23:39. Terrene will definitely be one of the favourites next Sunday. The Aussie knows what it takes, having won the 2013 Molokai crossing before missing her chance to defend through injury. Another interesting name on the Cline Mann results sheet was Jamie Mitchell. Jamie has been out of SUP racing for much of the past few years, after having famously won 10 straight Molokai 2 Oahu prone titles (and picking up a Battle of the Paddle win and a few ISA gold medals along the way). But perhaps buoyed by the imminent birth of his first child and motivated by a revamped JM Paddleboards brand, the “Captain” is keen to get back into racing in a serious way. Paddling a stock 14 footer, Mitchell finished sixth on the weekend, behind three of the unlimited guys and two of the stock boys – Riggs Napoleon and Christian Bradley. That’s not his greatest result, however it’s quite impressive considering Jamie couldn’t even lift his shoulder a couple of months ago. A series of crazy big wave beatings tore his joints to shreds, and it’s only been in the past month or two that he’s been back into paddling in a strong way. It’ll be very interesting to see if JM10 can carry this enthusiasm into the second half of the year, especially now that the Pacific Paddle Games will give the elite world a major showcase event in October. Speaking of shoulder injuries, it was great to see Riggs Napoleon returning to something close to his full strength. Riggs was out for several months earlier in the year after being forced into shoulder surgery. Riggsy’s amazing talents, his famous bloodline and young age (he’s not even 18 yet) mean he’ll probably be a genuine contender to win any of the big races over the next decade. Another name to pay attention to was runner-up Manny Kulukulualani. This guy is a complete unknown in the SUP racing world, however he’s something of a folk hero in the world of outrigger canoe racing. 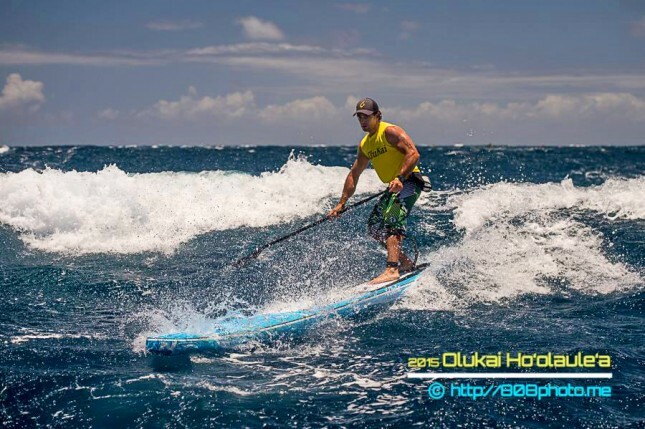 Manny is always one of the top contenders for the Molokai 2 Oahu OC-1 (one man outrigger) event. Travis Grant describes him as perhaps the most freakishly and naturally-talented paddler in the world. Could be a name to watch if he starts taking stand up paddling seriously. So there you go. That was the 2015 Cline Mann Memorial race. Full results are over on Paddle Guru, otherwise you can get the Top 10 below.